If you’re looking for a fun and creative way to improve your life, look no further than the development of your very own vision board. People use vision boards for a variety of reasons, but primarily, the intention behind creating a vision board is to engage the Law of Attraction (LoA).By using the Law of Attraction, you can subtly draw the things you desire most into your life. Sound far fetched? Don’t worry. We’ll explain exactly how this works, and how you can summon the power of the Law of Attraction through your vision board to manifest your most influential desires. A vision board, or dream board, is a compilation of images and words that help you focus on the goals and achievements you wish to attain in the future. Vision boards can have a specific theme, such as an ideal career, vacation spot, or personal milestone. Or, they can incorporate an assortment of ideas and images of things you’d like to obtain in your life, such as a specific home, exercise goal, or personal motto you want to focus on.Dream boards have proven to be quite effective in helping people reach their goals, pursue their aspirations, and attract specific items, people, and opportunities into their lives. What does this mean? Simply put, the Law of Attraction states that what we think about, we bring about. What we choose to focus our energy on, we make manifest in our lives. It can be challenging to keep a positive mindset when you’re inundated by the demands of the daily world. We have plenty to worry about, from work, to family obligations, to paying the bills on time, there’s no denying our lives have gotten complicated. But that’s where your dream board comes in. Vision boards help us stay focused on the positive things we want to bring into our lives. With a physical, visual reminder in front of us each day, we can more easily re-train our thoughts to the optimistic, hopeful aspirations we have for the future. Your dream board can be as focused or as broad in scope as you’d like. The sky isn’t the limit – you can pursue anything your heart can imagine! Many people create vision boards out of photos and words they find in magazines, mounting their assorted pictures on a piece of bristol board, cardboard, cork board, or any other sturdy, flat surface they can secure. Does your vision board have to be made of magazine and newspaper cutouts? Absolutely not! In fact, your dream board doesn’t even need to be made of physical materials. Pinterest is a fantastic medium for assembling and organizing your vision board. With the click of a few buttons, you’ll be well on your way to collecting the images, words, and ideas that will motivate you to pursue your dreams and go farther than you’ve ever gone before. Throwing together a vision board may not seem like too daunting a task – and it isn’t. But if you want your dream board to really shine, you may want to employ a few of these strategies to help you achieve your aspirations all the quicker. Before you pick up your first magazine or begin to browse your first Pinterest board, you’re going to want to organize your thoughts. What could be improved in my career, my social relationships, my personal health? Which area of my life needs the most kind and loving attention right now? What are some ideal goals and ambitions I’ve wanted to pursue in the past? See if you can come up with the answers to one or more of the above questions. Identifying what areas of your life you’d most like to improve will help you hone in on what work most needs to be done. If you’d like for your dream board to simply be a compilation of many dreams and goals, then by all means, make a list of the things you’d like to include. It’s your vision board – so make it yours! If you’d prefer for your board to be focused on a single goal, idea, or area of expansion, then now is the time to decide on your theme. Would you most like to improve your career? Your family life? Your health? Perhaps you’ve wanted to take a special trip but are having trouble staying organized and motivated. 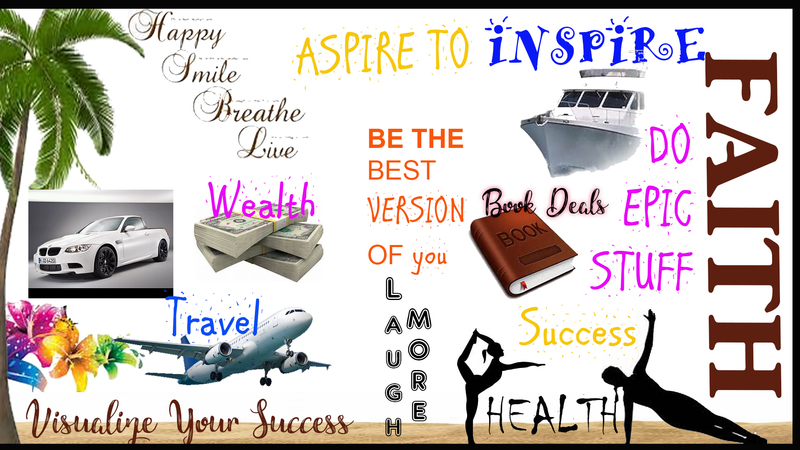 Your vision board will be your route to success! Whether you’re collecting images online, or are sitting in a collection of magazine cuttings, don’t be afraid to expand the horizons of your board. Magazines are a popular source for vision boards, as they’re often inexpensive to obtain (just try your local thrift store! ), and the large, colorful images look fantastic once compiled on your board. But don’t limit yourself to just one or two sources for your dream board. There are plenty of creative avenues to pursue! If you’d like to include a special quote or motivational passage, why not look it up online and print a copy of the webpage? You can cut out your desired quote and add it to your board. Once you begin crafting your board, you’ll find yourself noticing desirable images and words more and more as you go through your day. Maybe your local coffee shop has a paper coaster with a great quote on it, or you pass a billboard on your way to work with a beautiful image you want to capture. Snap a photo with your phone! Don’t be afraid to step outside the norm when it comes to the creation of your dream board. Your vision board is yours – your dreams, your aspirations, your milestones, your vision. Make it beautiful, and make it big. By make it big, we aren’t referring to the size of your board (although, if you want to cover an entire wall with motivational quotes and pictures, by all means, go for it! ).No, what we mean is: don’t be afraid to dream big. Tap into the power of your creative mind and unleash your imagination. You’re only limited by the restrictions you impose on yourself.Many times, when we dare to dream, our inner critics rise to the surface. You can’t do that, it’s too difficult. How will you ever succeed? You’re not qualified enough. You don’t deserve that. You haven’t earned it. This negative self-talk can erode our self-esteem and seriously delay the attainment of our goals and desires. Don’t let your inner critic stop you from reaching for your innermost aspirations. This life is yours for the taking. You do deserve it. Go out there, and make it happen. Have you ever made a vision board before? What would you include on your dream board? Be sure to let us know in the comments below! Thank you so much for this excellent article! With your help I am creating a vision board for the start of my time at university!